Artist Scott Gustafson has of late been inspired by aphorisms and the turn of a phrase including most recently the Fine Art Limited Editions Hear No Evil, See No Evil, Speak No Evil and Birds of a Feather Flock Together. Birds have the type of unique collective nouns that send Gustafson into inspired flights of fancy. A peep of chickens, a band of jays, a conspiracy of ravens, a murder of crows and yes, a parliament of owls! 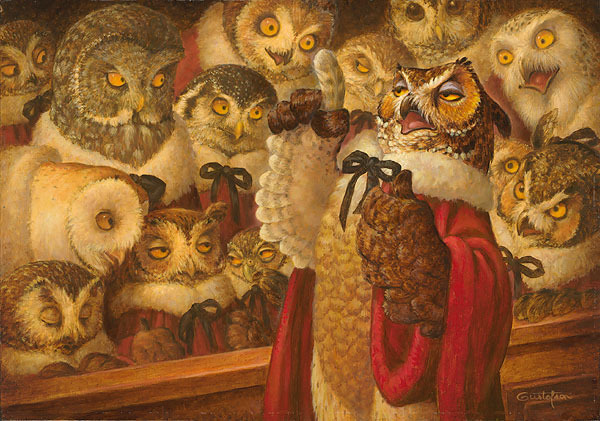 This Great Horned orator speaks with commanding authority and while the front row struggles to stay awake, most of the others are rapt listeners.